With my Christmas money last year I bought a couple of cast iron skillets. I hung them on the wall by the wood stove. Not everyone has cast iron hanging in their living room, but I do. This summer, I made the mistake of taking Pierce to a yard sale with me, and I seem to have created a monster. Now he wants to go to ALL THE YARD SALES. So every Saturday we seem to be going to yard sales. At one yard sale, a guy had three brand new cast iron skillets in a box, unopened. He sold them to me for $5. They aren't as high quality as my others, but it will be nice to have some smaller options in size if I need it. Do I cook with my cast iron? Absolutely. I've done cornbreads and frittatas and fried eggs. Once I made German pancakes. Just last night I did an egg, potato, and kale torte. It was delicious. Nope. I don't really mind if Pierce drags me to yard sales every Saturday. There are usually good finds to be had. Larry likes to cook in cast iron, especially cornbread. For some reason, I don't feel comfortable at yard sales. I think it's because it's hard for me to negotiate prices--I just want to pay what's on the sales tag. And I feel like I'm disappointing them if I don't buy anything. Isn't that silly? 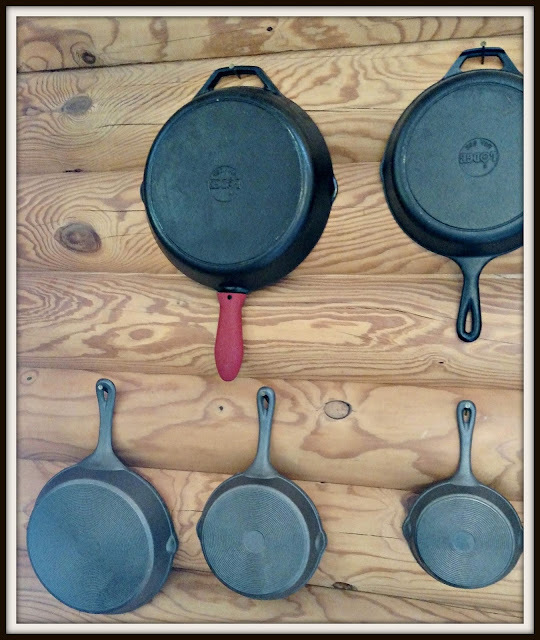 I have a friend with a huge collection of Griswold Cast Iron. Enjoy your weekend. That was a good deal on the cast iron as it lasts for years. I still use a skillet that my grandparents got as a wedding present in 1918. She kept it hanging as you went down her basement steps. Not sure why she put it there but it was high on the list of things I got when she died. I got their stove top percolator as well. I cook about everything in it but use a wok for stir fry. The food absorbs iron from the skillet so they are good for you. If you have a choice of sizes you have more selection when you decide to use one on someone too!!! Peanut butter fudge in a cast iron skillet....MMMMM, best thing ever. I'm learning to use cast iron, and I like it! Did you ever make pizza in one? A friend of mine used to bake it in a cast iron skillet, and it was delicious! That little Pierce! He's amazing, and I love the time the two of you have together at garage sales. This is just an awesome thing for you and Pierce to do for special times together! I lOVE the idea. And I am sure he finds things for himself too. It is kind of like hunting. I myself love thrift stores and go constantly! Most of my clothes are from Goodwill. The skillets look so pretty hanging there! I think hanging them in the living room is fine, because they are by the wood stove. You must be the best cook. The balloon festival is cancelled this year!!! I am super bummed. And I have heard it may not return. They will still have festivities, but just no balloons. That is about the only thing I use anymore. Been using cast iron for years! I cook everything in them! I love my pans! So happy to see someone else hangs theirs for display! Happy Sale Hunting! I have once cast iron frying pan, which is so heavy I can hardly lift it, but it will be used, but only after I have got the rust off it! It was new pan when I bought it, but Lester used it not knowing that it had to be seasoned first, so the food stuck to it, and then it was given a soaking, and then it was left on the draining board and forgotten about and that is when it got rusty. Not to worry, I shall get it sorted out eventually! Love a good yard sale -I always try find some when I visit USA. Hi Lisa, Oh I am glad Pierce enjoys yard sales with you. My mom and grandma always cooked with cast iron. Mother also had some cast iron trivets. The dishes you've prepared sound delicious. Great deal! Happy Fourth. I think your wall looks cool with them hanging on it! I know lots of homemakers who consider their cast iron as treasures . . . and lots of younger ladies who were glad to gave them gifted- either as hand-me-downs or wedding presents . . .
What a fun Saturday morning ritual for you both. I love cast iron....that and stainless are all we use in the kitchen now. Love that yours are on display! Congrats on the new pans. I have a glass top, and I guess those aren't supposed to be used on those. I'd love to use them though. I like cast iron. I refused to get a glass-top range because the label said not to use cast iron pans on it. Cast iron skillets are great to cook with. I own one and wish I had more. I love going to yard sales. I get a natural high off seeing what great bargains I can get.